Brooklyn Paper won the aquatic pun contest, while the Eagle doused readers with details about recent public meetings for the pool planned for Squibb Park, slated to open in 2020. Brooklyn Bridge Park President Eric Landau was joined at PS 8 by Kristina Drury, founder of Tythe Design, the community engagement firm hired by the Park, at gatherings to solicit suggestions and concerns about the permanent structure. According to our local reports, approximately 100 people in total attended the two sessions, held on September 12 and 16. According to Landau, an online survey has garnered over 1,500 responses. 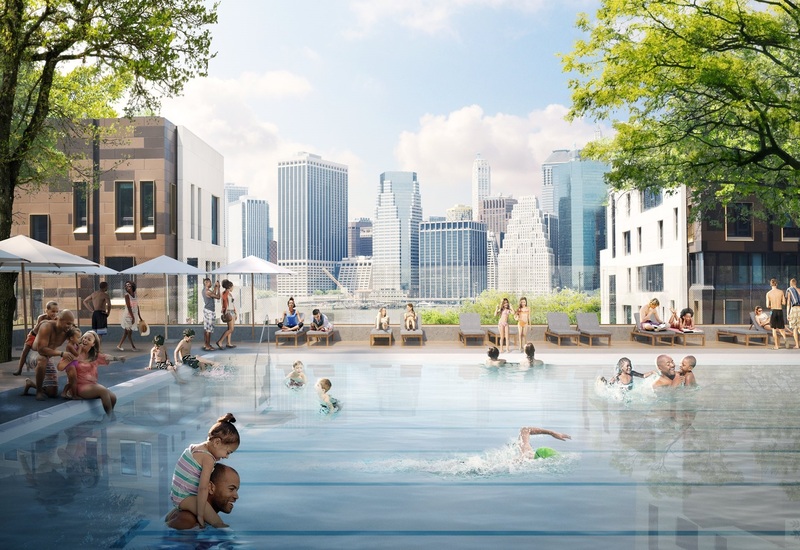 The pool is expected to double the capacity of the Pop-Up Pool, accommodating between 150 and 300 people, and cost between $10 and $15 million. Get all the details at the Eagle and Brooklyn Paper. Your clicks help support the good work of our local publications. Were you at the meetings? Tell us what you think. Hopefully some thought is given to the absurd state of affairs relative to the Squibb Bridge so that we don’t end up with a similar outcome for the Sqibb Pool. Since the Squibb Bridge was going to be the physical link between BBP and Squibb Pool, it appears that the idea already has “a far bigger structural flaw” than when it was first conceived. As I’ve stated elsewhere, this is right next door to the former JW buildings which are being transformed into an office/commercial development. As far as I’m concerned, the Heights will now end at Middagh and Columbia Heights. Is anyone aware of an organized effort to push for the pool to be located anywhere other than Squibb park? That Pop-Up pool is tiny, I’ve know people who have constructed pools that size out of gunite for $55K…so 20 times that for a pool just twice its size? Can we move onto the next bad idea please?